ORANGE COUNTY – Over 180 law enforcement officers from 19 agencies netted 31 juveniles in violation of city curfew laws last night in the 6th annual curfew sweeps by the Orange County Gang Reduction and Intervention Partnership (OC GRIP). OC GRIP aims to prevent juveniles from being victims of or participants in gang crimes by identifying at-risk youth, increasing school attendance, and decreasing gang activity. An 18-year-old man was found shot multiple times in an Anaheim apartment complex courtyard early Saturday morning and later died at a hospital, according to the O.C. Register. 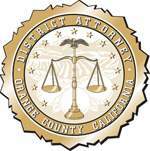 FULLERTON – A criminal street gang member was sentenced today to life in state prison without the possibility of parole plus an additional 25 years to life in state prison for the shooting-murder of a man, whom the defendant had intended to rob. Albert Lubo Ruedas, 25, Garden Grove, was found guilty by a jury June 15, 2011, of one felony count of special circumstances murder in the commission of a robbery and for a criminal street gang purpose and one felony count of street terrorism. The sentencing enhancements for the personal discharge of a firearm and criminal street gang activity were found true. SANTA ANA – A fugitive defendant, Guillermo Espinoza, 38, has been added to the Orange County District Attorney’s (OCDA) Most Wanted list. Espinoza was recently featured on America’s Most Wanted website. As gang violence explodes in Anaheim, what should the cops do? Two 19 year old youths have been stabbed in Anaheim in the past few days. One was innocent and the other was supposedly a gang member. Both appear to have been attacked by gang members.